Proper Talents is a recruitment & executive research company serving internal talent acquisition teams and executive search consultants. We help our clients find the right talent and assist them through stages of the recruitment process so they can strengthen their delivery. We are a team of Recruitment Consultants & Researchers with substantial international experience and a successful track record in Executive Search. We have worked on searches of all levels in both developed and emerging markets and across various industries, including Technology, Industrial, Financial Services, Consumer Goods and Professional Advisory within EMEA and APAC regions. Our purpose is to meet customers’ needs by providing quality recruitment research and ongoing support. We build relationships with our clients through accountability and desire for excellence. On top of that we are cost effective. Excellence: Our goal is to provide high-quality service and finest delivery. We believe this is the best way to retain clients and keep them coming back. Accountability: We put our best efforts through every aspect of the work and take personal ownership and responsibility for meeting our commitments. Cost-effectiveness: We add value beyond cost savings however this is an important aspect when choosing a research partner. We deliver quality service at a fair price. Eugen Enachi is the Co-Founder and Partner of Proper Talents. He has over 8 years of mid and senior level executive search experience providing support with cross-border candidate research within Technology, Industrial, Financial Services and FMCG, for clients of all size and across various functional areas including marketing, sales, finance, operations, IT. He managed over 100 recruitment and research projects working alongside consultants in EMEA, Asia and the US. Several years he supported one of the most valuable technology companies on globe with US origins. Eugen is passionate about helping others to thrive, has a strong sense of the right “fit” and a never-give up attitude. He is able to lead complex recruitment assignments and is highly committed to successful delivery. He holds a BCL degree, speaks fluent English, Romanian and Russian. Before founding Proper Talents, he was a Research Consultant in a leading international executive search firm, serving large strategic accounts. 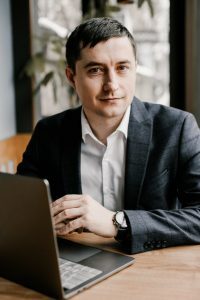 Vadim Draganenco is the Co-Founder and Partner of Proper Talents. He brings over 6 years of executive search experience for a diverse client set and across numerous industries, including Banking & Financial Services, Private Equity, FinTech, Information Technology, Telecommunication, Manufacturing and FMCG. He supported consultants and clients across CEE, Baltics, CIS, Africa, China, and the US, providing high-level research for numerous C-suite and middle management assignments. 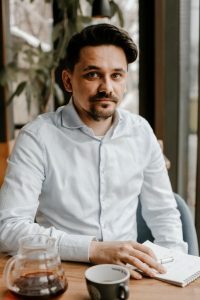 Vadim is a talented and experienced Researcher & Recruitment Consultant who delivers projects with a high degree of diligence. He will unearth what has been requested as part of a search whilst also obtaining data and insight taking the clients understanding to the next level. He holds a Bachelor’s degree in Public Administration and speaks fluent English, Romanian and Russian. Previously he worked as Research Consultant in an international executive search company.